Yiu-Khye turned 1 last weekend. For Khye's 1st birhday cake, I did what I usually do. Buy a cake and deco it myself, just like what I always do for all of Shern's birthday cakes so far (clik to view Shern's 1st, 2nd, 3rd and 4th birthday cakes). It is sure to taste good because I usually order cake I've tasted. With my own deco, I get to keep to the theme, and also save money on those "designer cakes" which usually cost a few hundred ringgit. Most importantly, it is less stress-free than me having to bake and design it, and to make sure I won't mess it all up. It is also a one-of-a-kind cake, which is more meaningful. In keeping with the Sunshine theme for Khye's birthday party, I'd ordered one of our family's favourite New York Cheesecake from Secret Recipe. It is a baked soft creamy cheese with chocolate cookie base, and is golden yellow in colour, perfect for our Sunshine theme. I don't like fondants so I usually deco my cakes without the use of fondant. I actually was cracking my head on how to deco a sun with edibles. And in the end, I chose to use orange slices with overlapping effect for the sun, and Pretzel sticks for the rays. And the word K H Y E was decorated using orange M&Ms. And topped with a single candle. 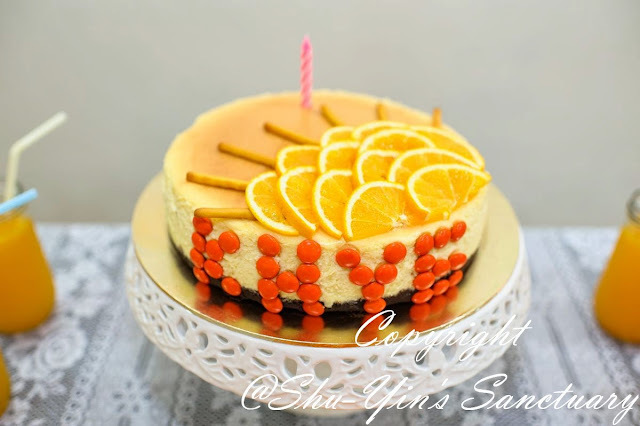 An awesome one-of-a-kind 1st SUNSHINE Birthday Cake for Yiu-Khye!